And now we bring you the long-awaited final installment of our recent discussion with Genpact's new President and CEO, NV “Tiger” Tyagarajan. Phil Fersht (HfS Research): Tiger, There's been a lot of talk about business platforms and bringing together clusters of standard processes, putting them in the cloud, etc. Do you feel the industry's really moving that way, or do you think it's a bit of a mixed bag? NV “Tiger” Tyagarajan (Genpact): I think it's a mixed bag. Some global companies have deliberately set up independent businesses to enable a “clean sheet of paper” approach. Within that are questions including, “Can we put everything on the cloud?” “Can we wrap services onto a platform and make it standard?” “Can we all buy in to a standard without fighting like cats and dogs about ‘my process’ and ‘your process’”? Here it all boils down to, are we willing to accept a standard even though different people have opposing views? The second situation is when large corporations are almost forced to venture into emerging markets, e.g., India, China or Brazil, in search of growth. In this scenario, they don’t have to worry about legacy processes and technology, which are expensive and time consuming. And with speed-to-market being so important, they believe they may as well hit the market running without having to invest in technology, instead investing in the cloud for just about everything. Then there are the mid-market companies that are growing rapidly, sometimes at a rate of 25-30 percent. For them, legacy systems don’t matter, because in three years their business will only be half legacy and within five years, it will have gone beyond that. Similarly, emerging market companies are easily willing to leap frog onto the cloud because of their up to 40 percent growth rate. And for them, as legacy is pretty archaic, their willingness to jump to the cloud is really high. Let me switch for a second to large corporations and their legacy platforms. We are finding that to be as tough as it was before. The fact is, if I walk into a global pharmaceutical company, even today its 100 (or however many) countries fight with each other on what is the right payables process for them. They are unwilling to sign on to a standard. So, I would argue, if they aren’t willing to sign onto a standard among themselves, the day of signing onto a standard that is a public cloud is far, far away. But I think if they agree to a standard among themselves, at least they can get on to a private cloud, which would be very beneficial. But I still see that being quite some time away. There’s not enough push happening, primarily because there’s so much legacy and cost sitting out there, plus entrenched decision-making and vested interests. People worry about what’s going to happen to their job if processes go to the cloud. So, I think there’s a little more hype than reality about everything going to the cloud, except in the cases I already talked about where we’re seeing movement. Tiger: I don’t think that ownership of technology will determine differentiation. I actually believe the reverse is happening. More and more we’re getting to a world in which technology is not owned by anyone. The best technologies are open. The best platforms are open. The best platforms are the ones on which anyone can build on top of them and tweak and change them. My fundamental view is that technology is only as good as the intelligence you build into it. So I believe that to differentiate ourselves, we have to search the world for the best technology, and then build in the intelligence. How do you do that? First, you have to understand a process in its granularity: what makes it best in class, how to get there, what works, what doesn’t, and its contexts in both the horizontal and vertical domains in which it belongs. Then… we all know that the world is getting filled with data. There’s more data generated than ever before. If something today is not electronic, the drive to globalization is actually making it more electronic. One of the things I think we’ve done as an industry is help companies become more electronic. We’ve pushed the envelope harder, because without going electronic, you cannot globalize. So, globalization is actually helping digitization and electronicization of information. Now when you have so much information available electronically and digitally, and it’s so easy to process from a cost perspective since storage is so inexpensive these days, who is building intelligence out of that data? Our argument is that in every industry there are companies that have decided their strategy is going to be building intelligence out of data. Our view is that those are the companies that will truly differentiate themselves, and those that don’t will start falling behind. And in my CEO job I’ve kind of championed smart decision services, where we build insights out of data for our clients, and then take those insights and build them into technology. I believe that differentiation comes in your ability to generate and build those insights for your clients, not in your ability to handle the platform. Phil: So, if you could change one thing about the BPO industry today, what would it be? Tiger: Can I pick two, one at the front end and one at the back end? Tiger: So at the front end, I really think too much time and effort is spent in repetitively going through the same selection process again and again and again, which keeps everyone at an arm’s length in an “I won’t tell you much” situation, for as long as 12-18 months. With how quickly the world moves today, 18 months is a heck of a long time. I don’t know of any other activity in an organization where people are given 18 months to do something. I’m not given 18 months to do anything. Instead, if you short circuit that, for example, to three months, then you can spend the next nine months, together with your chosen provider, going into the bowels of your organization and really figure out your roadmap to best in class. Then you can accelerate your execution by at least three months. But more importantly, because you spent nine months together in this venture, I think your solution is going to be much more robust, and will accelerate you to best in class so much faster. And I think the sourcing world has misunderstood this game as compared to buying laptops or travel, etc. It’s a different world. But any time you can move it along more quickly, you bring so much more benefit to the client. On the back end, I think the openness with which an organization approaches the relationship in order to accomplish the end goal…I can’t do it alone, and you can’t do it alone. We have to do it together. And yet, conversations around, “can we both put some skin in the game?” “You don’t own this, so you don’t worry about it. Let me do it.” “I can’t pay you for outcomes or I can’t share the gains”, just take too long. When we break through those barriers, both companies can gain so much more value. Phil: Well, there we have it! Thanks so much for all your time with us, Tiger - and all the best with the new job! 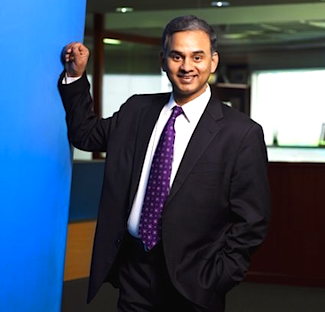 NV “Tiger” Tyagarajan (pictured) is Chief Executive Officer for Genpact. You can view his full bio by clicking here. Two of Mr. Tyagarajan's comments were particularly striking to me: "My fundamental view is that technology is only as good as the intelligence you build into it" and "globalization is actually helping digitization and electronicization of information." In many parts of the BPO industry, applications of both business intelligence and digitization are multiplying rapidly. There is one exception however. Call Centers. Said nicely, Call Centers are the final frontier for business intelligence and digitization. Said less kindly, they are the this-is-the-way-we-have-always-done-it part of the BPO industry that is remarkably slow to change. But it is precisely here, because the call center industry outputs are so completely dependent on human performance and because unaided human performance can never produce error-free quality, that the business intelligence and digitization Mr. Tyagarajan calls for are desperately needed. For example, take a very common example of inbound sales calls to a cable/media company. The mix-and-match bundle of services that each customer can choose is extremely large. Each combination requires that a unique set of disclosures and specific information...some legal, some educational...be provided so the customers know what to expect and so they don't have to call when they get their first bill. Why go through the brain-damage and added cost trying to train minimum wage agents who are likely to turnover relatively quickly all the combinations of services and what they need to say for each? Why monitor for that like cops with radar guns trying to catch speeders? Why pull them off the phone to coach them and hope they get it right next time? Here is an alternative approach that is exactly aligned with Mr. Tyagarajan's key points. Why not record (digitize) the audio for those disclosures, put them in a look up table that pulls the information on what the customer has ordered from the CRM (business intelligence), and play them to the customer in a voice the customer can easily understand, no matter what country (globalization) the agent is in? Short answer: there is no reason not to...it is better for the customers (no accents, right messages), it is better for the agents (they get to rest, less stress worrying about getting it right), and it is better for shareholders (legal cost savings, call prevention savings, etc). The faster the entire BPO industry and their clients see what Mr. Tyagarajan sees and move in that direction, the sooner the industry and their clients will achieve the continuously improving quality and concomitant cost savings and margin improvement long enjoyed by manufacturers and their outsourcing partners.